Now Available for immediate viewing Below! 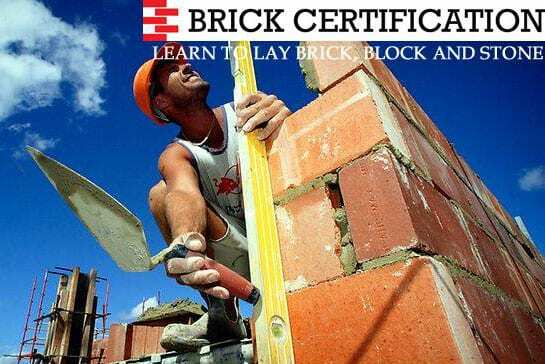 Brick Certification delivers a hands-on home study bricklaying course that provide career minded, do-it-yourself students the opportunity to learn the mason trade at their own pace and in the comfort of their own home or work space. When comparing the time and cost of our career oriented programs to an apprentice program or skilled trade school, our students get into a high paying job in months instead of years and save thousands of dollars in the process. A student of ours will recoup the cost of their hands-on home study certification course in the first 1-2 days of employment in their new job! DIYer’s will save thousands on a single project. Join Now And Get Access To Our Member’s Only Course! Beginning September 2017, the Master Mason Course is available in the form of a LIFETIME membership and is available for IMMEDIATE access upon checkout! No more having to download large files or wait for physical DVD’s to arrive in the mail anymore (unless you still want those). The lessons are now available online in the special Member’s ONLY area of our site. You will now be able to easily view them on your laptop, iPad, iPhone or Android phone 24 hours a day, 365 days a year. What does LIFETIME membership mean? It means we’re not going to hit you for more money later when we update our courses even though the cost of our course is likely going to increase in the near future. It means that if you buy our course now (or if you have ever purchased our course in the past), you will be eligible to view all future updates at no additional charge. Guess what? We are planning updates soon and the price of membership will also likely go up soon! With The Master Mason Course, Charlie will CERTIFY you and GUARANTEE YOU A JOB or he will give you all of your money back. Included is a recently revised lesson book to guide you in detail through the videos. Added Bonus! You get FOR FREE, Charlie’s Famous book, The Secret Of Squaring Up Buildings. Many who have purchased the book say it has saved them thousands of dollars in time and labor. Plus you will now have the satisfaction of knowing the project is perfectly square. Are you sincere about learning the great trade of bricklaying? One that has not changed much in over 5000 years? This trade won’t be replaced by any machine, it’s a trade that will NEVER be shipped to another country with cheap foreign labor only to be sent back to the USA as a finished product to be sold to Americans. If so, then bricklaying is the trade for YOU! We are improving this course as we speak, new videos are being added, older course materials are being upgraded. We are under some pressure to increase the price as we also teach this exact same course in-person for thousands of dollars. So if you ever considered becoming a brick mason, the time to LOCK IN your LIFETIME access to FREE, UPGRADED MATERIALS just might be NOW! To Purchase The Course, First Register By Filling Out The Form Below To Get started TODAY! DIY Mason Course - Full Online Access to ALL videos of our Bricklaying Course + PDF Lesson Plans + Bonus Book: The Secret Of Squaring UP. Does not include GUARANTEE of JOB or YOUR MONEY BACK.